You can often tell a lot about how band see themselves by the music they or their tour manager choose to play between acts. Here, the slight jaggedness of Neutral Milk Hotel’s King of Carrot Flowers Part One betrays a band keen to surprise. With Jeff Mangum and company, the surprises come in the form of instrumentation stretching from the quaint to the downright surreal; with Andy Hull and co. it comes in the form of a surprise eight song opening set from Bad Books – a collaborative effort between the majority of Manchester Orchestra, and the main force of the night’s supporting act, Kevin Devine & The Goddamn Band – which boasts impromptu freestyle rap from Devine, and which serves to blend the strongest suits of both the comparative sparseness of Devine’s songwriting, and Andy Hull’s vocals. Bad Books’ set also introduces the crowd to Kevin Devine, a New York based singer-songwriter whose seventh and eighth albums – Bubblegum, and Bulldozer – were recorded and self-released last year after a successful Kickstarter campaign which raised over $110,000. Devine’s own set draws heavily from the first of these; the punk tinged Bubblegum, the title track of which opens the set as a blistering two minute ode to young love which blends early Blink 182 and Green Day with the lyrical honesty of the like of Frank Turner. That isn’t to say that Devine is a one trick pony. Private First Class – dedicated tonight to Chelsea Manning – sees Devine couple punk spirit with the protest song fieriness of the likes of Bob Dylan, whilst set closer Brother’s Blood borders on the confessional, and shows Devine at his emotional, vulnerable best which perhaps could see him described as the USA’s answer to the emotional rawness of Frank Turner. It all, in truth, leaves Manchester Orchestra with a tough act to follow, and whilst they start the set full of fire and white-hot intensity with Pride, the early part of the set sees them plagued with myriad technical problems – with Hull stating after Pensacola “apparently tonight is the night we break everything we own” before moaning into a towel. It’s said with consummate professionalism and good humour –a recurring theme, with Jimmy Buffett’s Pina Colada Song getting a brief airing – but there is nevertheless a portion towards the middle of the set after 100 Dollars which seems to lack a certain vigour. It may be technical problems, it may be poor sound mixing, it may even be the structure of the songs themselves, but for one reason or another, Hull’s vocals are occasionally suffocated by waves of chugged distortion. acts in stark contrast to Deer’s self-loathing, whilst Where Have you Been? builds slowly but beautifully into a climax which can deservedly be described as “epic”, complete with it’s relatively sparse instrumentation, and synth choir. It would be the perfect point for any band to finish on. However, to do so would have robbed the evening of one of its more memorable moments The evening is instead brought to an end with Hull and Kevin Devine collaborating on stage to completely rework The Fresh Prince of Bel Air into a somewhat meandering little indie number which in a sense, goes against the very idea of what a closing song should be. It’s quiet it’s sparse, it’s fairly slow, and yet, in light of the night’s difficulties, it makes perfect sense. With the problems Manchester Orchestra have faced tonight, a many other bands would have made their apologies and re-scheduled, but tonight they’ve faced them, overcame them, and had enough left in the tank to make everybody leave on a lighter note. Conventional it might not be, but there is a sense that tonight, ending with the epic Where Have You Been? would have been too easy and rob them of a chance to do what they’ve had to do for a lot of tonight – laugh at themselves. 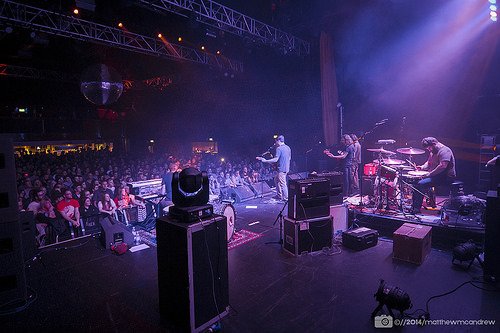 Posted in Music and tagged Gig Review, Glasgow, Manchester Orchestra, Music, O2 ABC. Bookmark the permalink.